Blue Devils explode for nine runs in eighth inning to sweep Highland – Welcome to Wyandotte Daily! 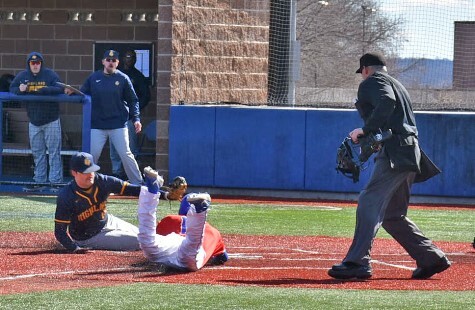 Kansas City Kansas Community College broke an 8-8 deadlock with a 9-run eighth inning for a 17-10 win to complete a Jayhawk Conference sweep of Highland Friday. The Blue Devils also scored late in a 7-2 opening game win that kept them unbeaten in Jayhawk play at 6-0 and stretched their winning streak to 12 in a row. 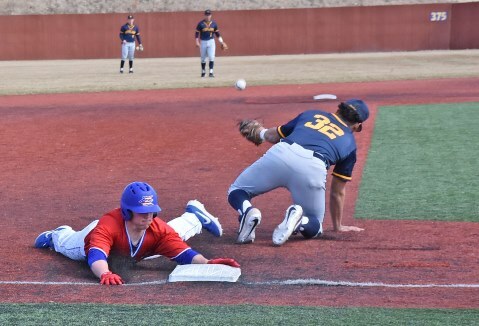 Highland and KCKCC were scheduled to complete their four-game series Sunday in a 1 p.m. doubleheader on the Benedictine College campus in Atchison. KCKCC broke the 8-8 tie with seven hits in the 9-run eighth. With one out, Eduardo Acosta singled and scored on Traice Harter’s tie-breaking double before the Blue Devils broke the game on triples by Tyler Henry and Acosta. After loading the bases on two walks and a Jose Sosa single, Kemper Bednar singled in a run, Henry tripled in two and Acosta tripled in three. Four Blue Devils had three hits in a 17-hit assault. Henry drove in four runs with his triple and two singles; Acosta’s tripled and two singled for three RBI’s; and Harter and Bednar each plated a pair with a double and two singles. The Blue Devils had to come from behind three times in the second game. After Highland took a 3-0 lead on Alejandro Torres’ 2-run home run in the first inning, KCKCC scored four runs in the bottom of the first on back-to-back RBI singles by Bednar, Henry and Griffin Everett. The Scotties retook the lead 5-4 in the second only to have KCKCC go back in front 6-5 on singles by Acosta, Harter and Kevin Santiago. KCKCC added a seventh run in the fifth on a double by Bednar, single by Henry and Everett’s sacrifice fly but needed a run in the seventh to tie it 8-8. Sosa’s second single, Bednar’s sacrifice bunt and Henry’s one-out sacrifice fly got the Blue Devils even. Jose Amaro, the fourth Blue Devil pitcher, got the win, pitching a scoreless eighth inning and then giving up a pair of meaningless runs in the ninth on a two-out triple. Carlos Soto worked the first 2 1/3 innings, allowing five runs on five hits, walking three and striking out four. Max Storch came on to leave the bases loaded with a pair of strikeouts in the third but then allowed three runs on three hits to start the sixth before Zavier Morin pitched out of a bases-loaded jam and then worked a scoreless seventh. Sophomore Orlando Ortiz won his fourth game without a loss in the 7-2 opener, allowing four hits and one earned run in five innings. He struck out seven and walked one before freshman Gabe Ramos finished up for his second save, striking out one while facing just six hitters. “Good pitching performances for Ortiz and Ramos with shut down innings,” Goldbeck said. The Blue Devils broke open the game open with a four-run sixth inning. Henry tripled in the first run and scored on a throwing error and KCKCC added two more runs on a walk, passed ball on a strikeout and Eric Hinostroza’s single. The Blue Devils took a 1-0 lead in the second on singles by Bednar and Henry and Kaleb Harrison’s ground ball. Highland tied the game with an unearned run in the third and went ahead 2-1 in the fourth on Jackson Gonzalez’ two-out single. The Blue Devils tied it in the bottom of the inning on an error, Bedner’s second hit and Harrison’s sacrifice fly and then went ahead 4-3 on Acosta’s double. At Baker University for a 9-inning game Tuesday, the Blue Devils resume Jayhawk action Thursday when they play host to Allen County in a twin bill starting at 1 p.m.